He lost his past but found a blade. It was an odd trade-off to say the least, but a completely appropriate one since now he is a paladin of the just and smiter of the unrighteous. The pirate of the Black Sails is an arrogant man. "I've gone through several armies. Because many sailors don't yet realize that I can kill them all if I please. Alone. Unaided. The strongest of them soon understand that if you are the last to survive, then you will please me the most before you die. They jump at the chance to die first." But as a sailor for the queen's royal navy, it is your job to bring this pirate to justice, once and for all! 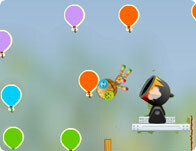 Use your mouse to aim at the different monsters and protect the group of kids.